Storm Team4's Doug Kammerer and Amelia Draper have the forecast for Tuesday afternoon and beyond. It’s time to pull out your heavy winter jackets from the back of the closet. 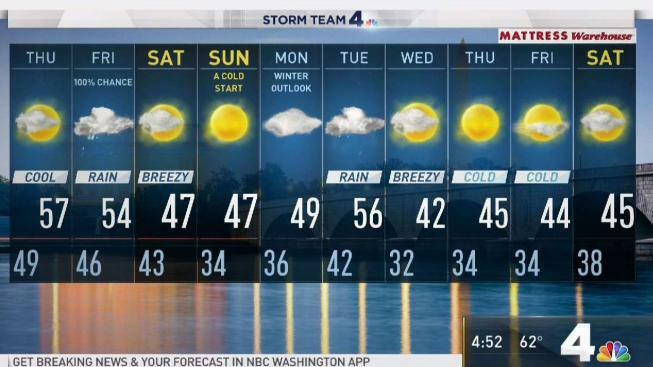 Temperatures are expected to drop near freezing in the D.C. area starting Sunday. Storm Team4 says we’ll have a high of 47 and low of 34 on Sunday, marking our coldest weather so far this season. "That's some really cold air for this time of year," Chief Meteorologist Doug Kammerer said. We're looking at temperatures in the 40s and 50s for Thursday and Friday, with rain on Friday, including during the evening commute. Saturday will be blustery, with a low in the low 40s and a high of about 47. Then, Sunday will start out in the 20s in the suburbs and in the low to mid-30s inside the Beltway. A widespread freeze is likely. Highs next week will be mainly in the 40s, with lows staying chilly, in the 20s and 30s. Our normal high for this time of year is about 60, and our normal low is about 43.